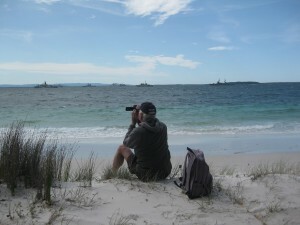 No News, but the big ships came to Jervis Bay first! 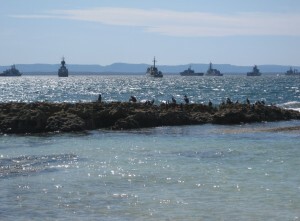 Before the much heralded arrival of the fleet into Sydney Harbour, ships entered Jervis Bay to moor in deep anchorage. It was hard to get close-ups from the beach at Scottish Rocks, but I liked this view of the cormorants taking a break from fishing, facing the biggest collection of vessels they’d have seen in their short life times. A sea eagle took particular notice, swooping near the sterns as if hoping they might prove to be fishing boats, before soaring high, in show off style. It may seem remote – but that’s just my inadequate photography. It’s common to watch the navy training in Jervis Bay, one of the reasons it makes such an exciting body of water – helicopters, dolphins, whales, the occasional seal – and gannets gymnastics. But to see so many big tough ships, peacefully at anchor, hard to tear oneself away. This entry was posted in Uncategorized by crawford. Bookmark the permalink.